The result of thousands of years of volcanic activity, the island of Milos features a craggy coastline interspersed by shallow beaches. You'll enjoy a bit of beach vacationing at Paliochori Beach and Kleftiko Beach. Escape the urban bustle at Sarakiniko Beach and Tsigrado Beach. There's lots more to do: enjoy the sand and surf at Firiplaka Beach, look for gifts at Vanilla, and take in the architecture and atmosphere at Church of Agios Haralambos. To see ratings, other places to visit, and other tourist information, read our Milos trip maker tool . Cairo, Egypt to Milos is an approximately 4-hour flight. When traveling from Cairo in November, plan for a bit cooler days in Milos, with highs around 22°C, while nights are about the same with lows around 16°C. Finish your sightseeing early on the 7th (Wed) to allow enough time to ride a ferry to Fira. Explore hidden gems such as Perivolos and Skaros Rock. Get outdoors at Nature & Wildlife Tours and Amoudi Bay. There's much more to do: see the interesting displays at Museum of Prehistoric Thera, take in the exciting artwork at S.M.A.G Spira Marble Art Gallery, do a tasting at Santo Winery, and get impressive views of Santorini Volcano. To see reviews, ratings, other places to visit, and tourist information, refer to the Fira trip website . Traveling by ferry from Milos to Fira takes 2 hours. Alternatively, you can do a combination of flight and bus. In November in Fira, expect temperatures between 23°C during the day and 17°C at night. Finish up your sightseeing early on the 11th (Sun) so you can catch the ferry to Naxos. Your itinerary includes some good beach time at Mikri Vigla Beach and Agios Prokopios Beach. Fish & Olive and Eggares Olive Press Museum will appeal to museum buffs. There's much more to do: kick back and relax at Plaka Beach, stroll through Agia Anna Beach, take a peaceful walk through Alyko Dimou Naxou, and stop by Naxia Sweet Home. To see ratings, maps, and tourist information, use the Naxos online travel route planner . Traveling by ferry from Fira to Naxos takes 1.5 hours. Alternatively, you can do a combination of bus and flight. Expect a daytime high around 22°C in November, and nighttime lows around 16°C. Cap off your sightseeing on the 14th (Wed) early enough to travel to Paradise Beach. 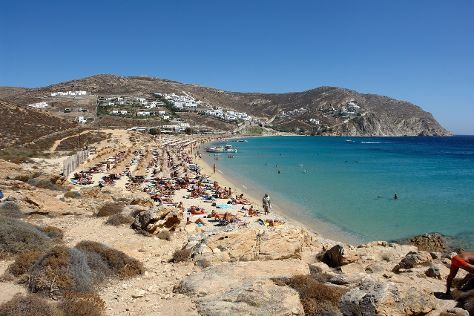 Sun-drenched Paradise Beach remains largely responsible for Mykonos' nickname, the "Ibiza of Greece." Considered one of the island's major attractions, the beach draws a young crowd of hedonists with its bars and clubs, serving cold drinks and a party atmosphere. Kick off your visit on the 15th (Thu): enjoy the sand and surf at Super Paradise Beach, kick back and relax at Elia Beach, and then make a trip to The Windmills (Kato Milli). Get ready for a full day of sightseeing on the 16th (Fri): enjoy the sand and surf at Platis Gialos Beach, then stroll through Ornos Beach, and then make a trip to Matoyianni Street. For where to stay, maps, ratings, and tourist information, go to the Paradise Beach tour builder app . Traveling by combination of ferry and taxi from Naxos to Paradise Beach takes an hour. Alternatively, you can do a combination of ferry and bus. In November, daily temperatures in Paradise Beach can reach 21°C, while at night they dip to 17°C. Cap off your sightseeing on the 16th (Fri) early enough to travel to Skiathos. Boasting some of Greece's finest beaches, Skiathos swells with vacationers from colder European countries at the height of the tourist season. Get in touch with nature at Mandraki Beach and Lalaria Beach. Relax by the water at Agios Ioannis Beach and Elia Beach. There's lots more to do: kick back and relax at Maratha Beach, tour the pleasant surroundings at Koukounaries Beach, make a trip to Monastery of Panagia Kechria, and take in the architecture and atmosphere at Agios Nikolaos Church and Clock Tower. For ratings, traveler tips, reviews, and other tourist information, read Skiathos vacation planner . Traveling by combination of bus and flight from Paradise Beach to Skiathos takes 4.5 hours. Alternatively, you can do a combination of car and ferry. November in Skiathos sees daily highs of 20°C and lows of 16°C at night. Cap off your sightseeing on the 20th (Tue) early enough to travel to Corfu Town. Often called "Kastropolis" because of its majestic Venetian castle, Corfu Town once featured such extensive fortifications that a force of over 20,000 soldiers defended them. 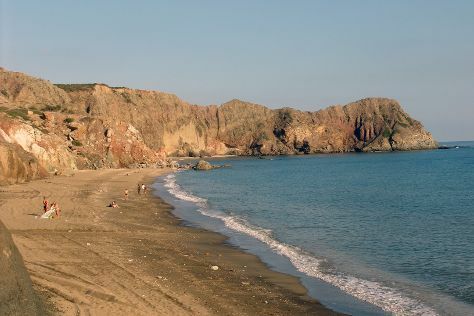 Visit Agios Georgios Beach and Barbati Beach for some beach relaxation. 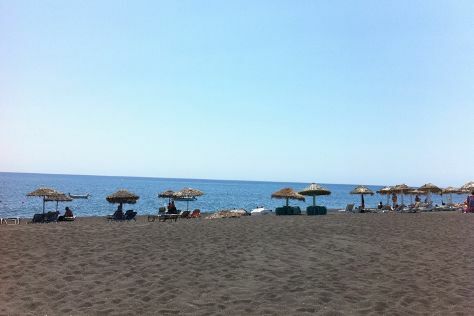 Take a break from the city and head to La Grotta Beach and Alikes Lefkimis. Change things up with these side-trips from Corfu Town: Sidari (Canal D'Amour & Sidari Beach) and Mavroudis Family Museum and Modern Olive Oil Press (in Vraganiotika). And it doesn't end there: wander the streets of Corfu Old Town, see the interesting displays at Banknote Museum of the Ionian Bank, look for gifts at Mezzo Mezzo, and steep yourself in history at Kassiopi. For maps, photos, ratings, and other tourist information, read Corfu Town road trip planner . You can fly from Skiathos to Corfu Town in 1.5 hours. Alternatively, you can do a combination of ferry and flight; or do a combination of ferry and car. Expect slightly colder evenings in Corfu Town when traveling from Skiathos in November, with lows around 13°C. Finish up your sightseeing early on the 24th (Sat) so you can travel to Lefkada. Connected to mainland Greece by a long causeway and floating bridge, Lefkada represents more than just an island paradise of modern seaside resorts and pristine Ionian beaches. 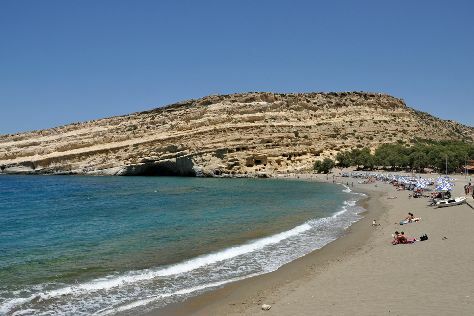 You'll enjoy a bit of beach vacationing at Milos Beach and Kathisma Beach. Step off the beaten path and head to Egremni Beach and Nydri Waterfalls. The adventure continues: kick back and relax at Porto Katsiki, take an in-depth tour of Folklore Museum Karia, choose your vessel at Sivota Boat Rentals, and do a tasting at Lefkas Earth Winery. To find photos, reviews, more things to do, and other tourist information, you can read our Lefkada trip builder app . Traveling by combination of ferry and car from Corfu Town to Lefkada takes 4 hours. Alternatively, you can do a combination of ferry and bus. 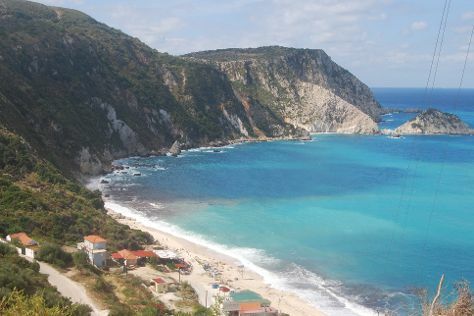 In November in Lefkada, expect temperatures between 22°C during the day and 13°C at night. Finish your sightseeing early on the 27th (Tue) to allow enough time to travel to Lixouri. You'll discover tucked-away gems like Makris Gialos Beach and Petani Beach. Visit Myrtos Beach and Antisamos Beach for some beach relaxation. Step out of Lixouri to go to Pesada and see Divino Wines and Vinegar, which is approximately 48 minutes away. For more things to do, maps, ratings, and other tourist information, read Lixouri road trip planner . The Route module can help you plan travel from Lefkada to Lixouri. In November, daily temperatures in Lixouri can reach 23°C, while at night they dip to 15°C. Cap off your sightseeing on the 30th (Fri) early enough to travel to Vasilikos. Home to just a few hundred year-round residents, Vasilikos draws thousands of daily visitors with its beaches and restaurants during peak tourist season. Explore hidden gems such as Speed Boats Tours and Gerakas Beach. Your itinerary includes some good beach time at Xigia Beach and Porto Zoro Beach. Get out of town with these interesting Vasilikos side-trips: Giatras Museum-Dionysios Art Gallery (in Agalas) and Aristeon Ecological Olive Press (in Lithakia). Next up on the itinerary: kick back and relax at Banana Beach, look for gifts at Razi Aroma, take in the architecture and atmosphere at Agios Dionisios Church, and stroll through Kalamaki Beach. To find photos, where to stay, and other tourist information, go to the Vasilikos online itinerary planner . Traveling by combination of car and ferry from Lixouri to Vasilikos takes 3 hours. In November in Vasilikos, expect temperatures between 22°C during the day and 13°C at night. Wrap up your sightseeing on the 5th (Wed) to allow time to travel to Plakias. Visit Preveli Beach and Frangokastello Beach for some beach relaxation. Get in touch with nature at Matala beach and Skinaria Beach. Explore the numerous day-trip ideas around Plakias: Folk Museum of Spili (in Spili), Kurtes (in Zaros) and Agia Marina Donkey Rescue Sanctuary (in Mires). To find ratings, other places to visit, traveler tips, and other tourist information, you can read our Plakias online trip planner . Traveling by combination of taxi, flight, and bus from Vasilikos to Plakias takes 7.5 hours. Alternatively, you can do a combination of bus, ferry, and taxi. In December, daytime highs in Plakias are 17°C, while nighttime lows are 10°C. Finish your sightseeing early on the 8th (Sat) so you can drive to Chania Town. Visiting Agia Marina Beach and Scuba & Snorkeling will get you outdoors. We've included these beaches for you: Agii Apostoli Beach and Seitan Limania Beach. Explore Chania Town's surroundings by going to Sfinari Beach (in Sfinari), Falassarna Beach (in Falassarna) and Historical and Folklore Museum of Therisos (in Theriso). And it doesn't end there: take an in-depth tour of Archaeological Museum of Chania, stop by Mitos Objects of Art, and stroll through Sosorides Beach. For traveler tips, photos, and more tourist information, go to the Chania Town trip itinerary builder tool . Getting from Plakias to Chania Town by car takes about 1.5 hours. Other options: do a combination of taxi and bus. In December, plan for daily highs up to 17°C, and evening lows to 10°C. Finish your sightseeing early on the 12th (Wed) to allow enough time to travel to Lindos. Explore hidden gems such as Agathi Beach and Archaeological Museum of Rhodes (Hospital of the Knights). Your itinerary includes some good beach time at Prasonisi Beach and Tsambika Beach. Explore Lindos' surroundings by going to Kounaki Wines (in Ebonas), Ebonas Winecellar (in Embonas) and Afandou Beach (in Afandou). On the 16th (Sun), enjoy a perfect day by the water at Faliraki Beach. The adventure continues: make a trip to Monastery Tsambika, take in the exciting artwork at Art Park Rhodes, and tour the pleasant surroundings at Lindos Beach. To see photos, ratings, traveler tips, and other tourist information, use the Lindos trip maker . You can do a combination of bus and flight from Chania Town to Lindos in 8.5 hours. Another option is to do a combination of bus and ferry. In December, daytime highs in Lindos are 19°C, while nighttime lows are 13°C. Wrap up your sightseeing by early afternoon on the 17th (Mon) to allow enough time to travel back home.